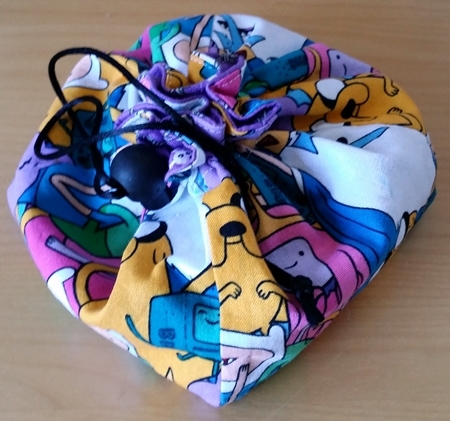 This Adventure Time dice bag rides in my gaming bag every day, just in case. What’s inside? Why, it’s a big ol’ pile of Rory’s Story Cubes! I carry these to every game because they’re one of the most useful improv tools in my GMing toolkit. 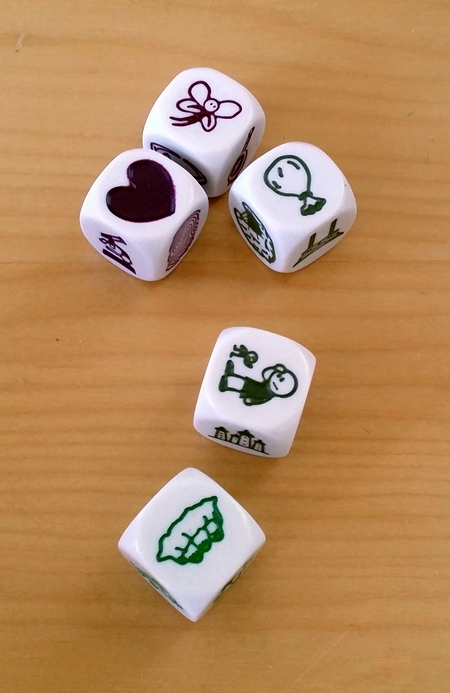 I don’t find every Story Cubes set to be perfect for improv GMing — Actions, for example, doesn’t really meet my needs (but it might meet yours; YMMV, and all that). 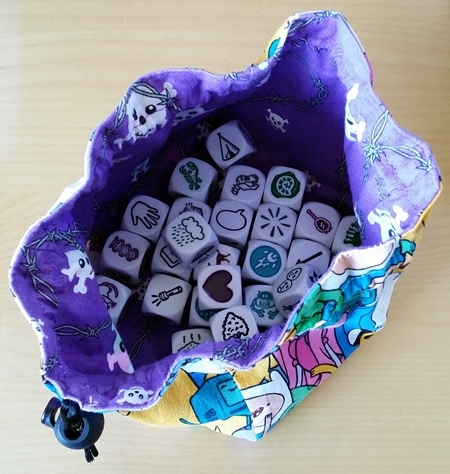 There are also newer sets I haven’t considered, but I worry that having too many dice in this bag would dilute some of its potency; this amount is a good fit for me. These dice are well-made: a nice size, tumbled, etched, and well-inked. They’re easy to read, even for my aging eyes. The symbols are whimsical, but also tuned for what I find to be an interpretive sweet spot: It’s a dinosaur, but that can mean a literal dino, an old person, someone with antiquated habits, a museum, an archaeological dig site — and so on. That interpretive sweet spot applies just as well when rolled together — better, even. The instant context provided by the rest of the roll, and my imagination, makes different meanings pop out at me. The most common thing I do with my Story Cubes is reach into the bag, grab a handful (no specific amount) of dice, roll them, and just look at the results for a moment. I generally do this when I need a jolt — perhaps I’m feeling stuck, or I’m considering an element of the game that I hadn’t considered before, and some random inspiration seems like it would help. That’s totally unscientific! But it works for me. But I sometimes use them for more specific things — like coming up with NPCs (which I wrote about on Gnome Stew three years ago). That could be: a planar traveler who uses a magic gemstone to slip into other worlds, a globetrotting hypnotist, someone under the influence of a cursed jewel (ignoring the globe; I often do this if I can’t use every die in a throw), and so on. The first thing I thought of was an adventure hook: giants are using enchanted bees to put people to sleep so they can steal their treasure. I read the dinosaur eggs as sleeping babies when I first saw that die, and interpreted the heart to mean that this was a charming, Disney-esque plot rather than a more serious one. 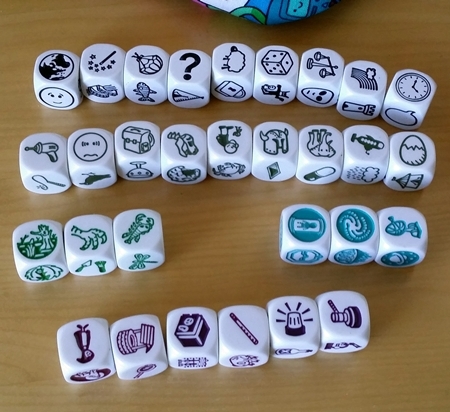 If you looked at those throws and started getting ideas for an NPC or other game element, then you’ll probably like Story Cubes. Lastly, I like just having Story Cubes nearby when I’m GMing, because I know they’re there if I need them. Zero-prep GMing still makes me nervous sometimes (and I suspect it always will), so knowing I’ve got a proven, useful tool for getting back into the groove — or finding the groove, or unsticking my brain — in my gaming bag is comforting. 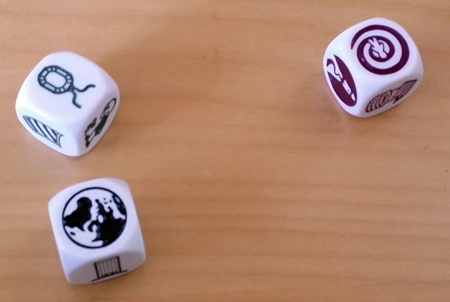 And that’s one of the coolest things about Rory’s Story Cubes: They have a million gaming applicatons. Throw in being inexpensive and well-made, and they’re incredibly easy to recommend. I just found out that there were Doctor Who Story Cubes at SDCC. Now my life isn’t complete. I’d enjoy using the strongly IP-themed ones for games in those universes, I suspect. Doctor Who would be especially well-suited to this kind of improv, too.